In the first ad, a semi-nerdy-looking driver takes off to work in the morning with a spring in his step after getting in his new Prius. He gets the hang loose sign from an old lady and splashes a gigantic, gas-sucking pickup as he dashes past the gas station. It only gets weirder from there. In Toyota’s second Super Bowl commercial for the new Prius, criminals used the new-generation hybrid to escape after a botched bank robbery. While the Prius definitely should not be the vehicle of choice for escaping convicts, it is more fun to drive than the last generation. Honda has jumped in with a spot for its brand new Ridgeline pickup. The ad features a flock of sheep being dropped off at their usual grazing spot by a busy farmer in a Ridgeline, which happens to come with stereo speakers in the cargo bed. The flock joins in on a stirring rendition of Queen’s “Somebody to Love.” A flock of sheep singing Queen? What’s not to love? Christopher Walken is one of those character actors who keep on giving. 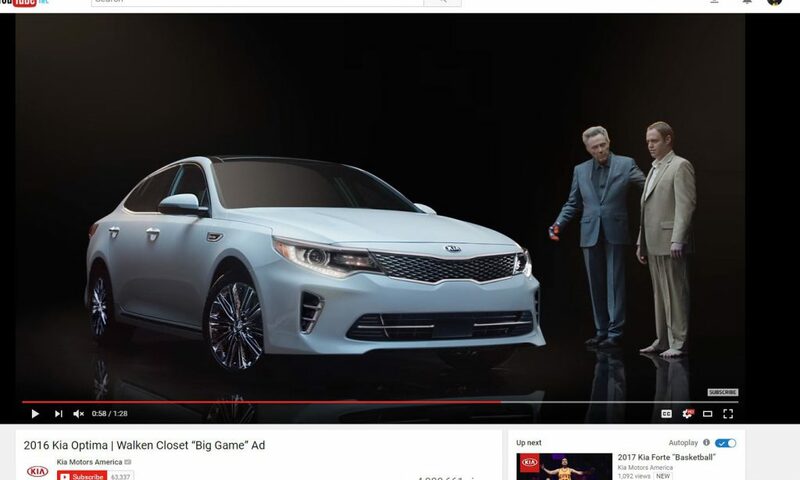 Kia tapped everyone’s favorite caricature actor, Christopher Walken, for its big Super Bowl ad, this time promoting the 2016 Kia Optima. This is the seventh year Kia has placed an ad during the big game. In the commercial, a man who dresses only in beige gets a visit from Walken in his closet (get it, Walken closet?). The Academy-Award winning actor convinces the man in beige to ditch those boring socks and drive a Kia Optima instead. Sure, it’s a stretch, but all these ads are, and that’s why we love ’em. By popular demand, Acura’s supercar, the NSX is BACK with a vengeance. With a starting price tag of $156,000, the Acura NSX supercar might be the most expensive product appearing in a Super Bowl ad this year. Acura estimates annual demand for the made-to-order car at just 800 vehicles annually. So why spend the estimated $5 million it costs to run a 30-second Super Bowl ad on a niche product that the majority of people watching the game probably cannot afford? According to Acura, the goal is to use the flashy car to highlight the Acura brand’s new “precision crafted performance” marketing theme and also win some love for lower-priced models. But the NSX is very much the star of the 30-second ad, which will run in the first quarter and was created by Mullen Lowe, Los Angeles. Backed by the classic Van Halen song “Runnin’ with the Devil,” the ad dramatizes the production process involved in making the NSX. Extreme close-ups portray melting aluminum, sparks flying and the engine revving. Hyundai’s third Super Bowl spot is for the new Genesis sedan and features comedian/actor Kevin Hart as the doting father, who begrudgingly sends his daughter off on her first date. Hart uses Hyundai’s Blue Link Car Finder feature to spy on the couple, and like with everything Hart does, as you can see hilarity ensues. What did you think of Super Bowl 50’s crop of automotive advertisements? Which was your favorite? Do you agree with our list or did another automaker’s commercial really rev your engine? Either way, we’re sure that each of these auto manufacturers are hoping that their ads enticed some viewers to help choose their next vehicle. Let us know what your thoughts are in the comments section below and check back for more up-to-date automotive coverage from Shoptalk, powered by Endurance!